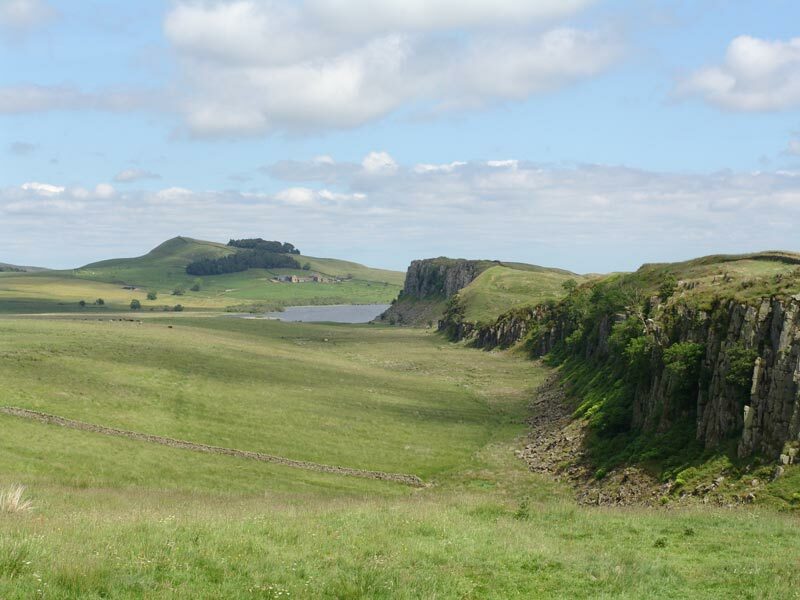 Hadrians Wall walks and other walks in the region. There are few places in England more trodden by holiday walkers than the Hadrians Wall Path which stretches from Bowness-on-Solway, Cumbria, to Tyneside in Northumbria. 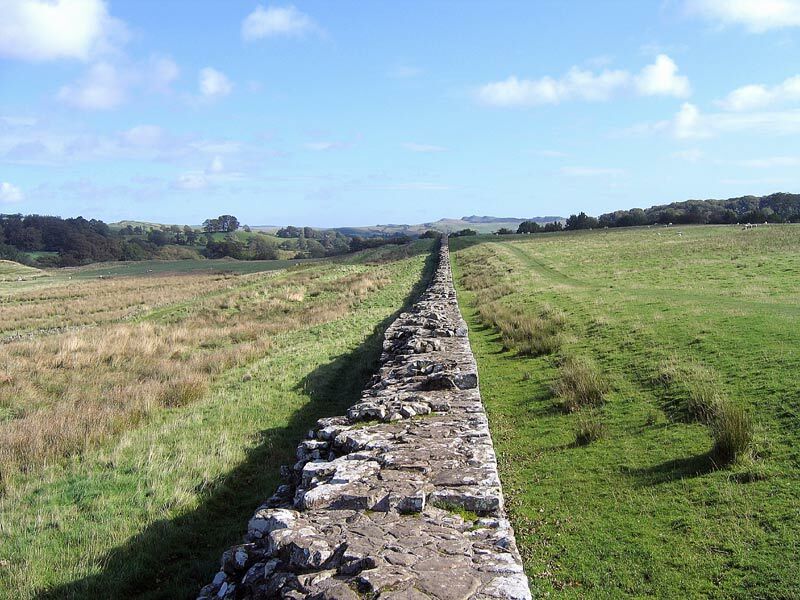 The trail follows the 84 miles of Hadrians Wall, constructed during the time of the Roman Occupation and completed in AD122. Landscapes, seascapes and cloudscapes present a panorama which has few equals and has remained largely unchanged over centuries. This area of enduring beauty, once known as the "Debateable Lands", fiercely fought over by local clans and home to marauding Border Reivers created one of the most violent regions in Britain. Some law and order was eventually restored during the reign of James 1, but by this time many Reivers and families had wearied of the constant warfare and sought a new life in the Americas and Australia. The Hadrians Wall Path is not a leisurely stroll; it requires careful preparation if the complete length is to be attempted. May to October is the better time when the ground is drier. Allow 6-7 days and research and reserve accommodation well in advance. Try and make a note of shops, cash points and public transport facilities along the route. The Hadrians Wall Bus Service A122 operates between Carlisle and Newcastle from Easter – November stopping at towns and villages on the way. There are some sections which provide easy access for those less well abled and the Walk is also linked to several other appealing shorter walks. Cyclists are not forgotten. Hadrians Cycleway begins at Glannaventa Roman Bath in Ravenglass and follows the line of Hadrians Wall for much of the ride to Arbeia Roman Fort in the east of the country. It's a well way-marked route largely over gravel and tarmac surfaces and minor roads. As with the walkers, it's advisable to plan and reserve accommodation well in advance. No matter if you are on foot or two wheels, this is a wonderful journey over some of Northern Englands most spectacular scenery and an adventure not to be missed. There is an air of imperturbability about this small community of brightly painted stone cottages flanking narrow streets, one pub and a 12th C church which was partly built with stone taken from Hadrians Wall. It occupies a position within an area designated as one of Outstanding Natural Beauty with long distance views across the Solway to the Scottish mainland. The nearby saltmarsh and wet grasslands of Campfield Marsh RSPB where cattle quietly graze are home to a varied mix of native wildlife. Viewing points and hides with wheelchair access are available. Bowness on Solway is not only the start and/or finish point of the Hadrians Wall Walk, it is a perfect longer term holiday destination. Accommodation both in the village and the surrounding areas provide high standards of comfort, good value for money, and many with rooms overlooking the beauty that is the Solway Coast. Bus Services. The AD122 operates a service between Carlisle and Newcastle, and Stagecoach operate the all-year-round 93 service between Bowness and Carlisle..
Post Office. The Post Office is housed within a private dwelling half way along the main street. With effect from November 2nd 2009, it will be open on Mondays only from 9am – 5pm. Until then it opens Monday and Thursday from 9am to Noon and 1pm to 3pm. A sign placed on the pavement during opening hours will show the location. A long straight narrow road without walls or hedging is an opportunity for fine views as it follows the coastline from Bowness on Solway to this scattering of houses, a well kept bowling green, and a comfortable pub with offerings of bar snacks and a selection of real ales, wines and spirits. It occupies a peaceful setting of uninterrupted coastal views. A worthy travellers rest. Burgh stands within the Solway Coast area of Outstanding Natural Beauty and the Hadrians Wall World Heritage Site. Close by are the villages of Moorhouse and Thurstonfield where it is said Bonnie Prince Charlie visited during his siege of Carlisle in 1745. To the west are the hamlets of Dykesfield and Longburgh. Burgh by Sands is a peaceful community far removed from its days as a centre of Border warfare when as the lowest fordable point on the Solway, armies crossed and recrossed during the 300 years of vicious conflicts. John Stagg, Cumbrian dialect poet and known as “The Blind Bard” was born in the village. He lost his sight in a childhood accident and spent his life writing of the local people their dialect and customs. Burgh by Sands is a convenient stop-over on the walk. The coastal area teems with wildlife and is renowned for birdwatching opportunities. There are chances of otter sightings, and, very occasionally, small whales. Accommodation in and around is especially walker friendly. The local pub provides warmth, a good menu prepared from local produce, bar snacks and a good selection of drinks. The Post Office, across the road from the pub opens twice a week on Mondays and Thursdays from 9am to midday and 3pm to 5pm. Here you may purchase from a selection of home-made jams and chutneys. Cash Point within the shop. Walkers will find the doors open for food and drink from 10a.m. Tuesday to Thursday inclusive during the summer months. Excellent home cooked fare from local produce. Call 01228-576579. Monkhill, Grinsdale and Beaumont are examples of small village communities close to Hadrians Wall where everyday life comfortably co-exists with relics of days gone by. Friendly owners offer a comprehensive range of accommodation suited to the needs of the walker and cyclist. There are views over and beyond the Solway Estuary and relaxing riverside walks alongside the northwards flowing River Eden, where, at its narrowest point close to Beaumont, cattle drovers and border raiders crossed. Sections of St; Marys Church, Beaumont was built using stone taken from the Wall. There are some limited bus services to the regions capital of Carlisle. A city with the imprints of history for all to see. Plenty of accommodation both within and on the outskirts plus the chance to replenish your rucksack from any number of retail outlets. A choice of cash points, post offices, banks, bus and mainline railway services. Take time to visit the very informative Tullie Museum, Carlisle Castle, the Cathedral and the old city walls. From here you will soon be entering a section of fewer amenities so stock up well. 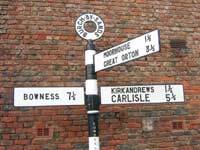 For more information on Carlisle, see our Carlisle Tourist information page. Irthington is a small community standing only half a mile from Hadrians Wall and set amidst a peaceful countryside crossed by paths and bridleways for both walkers and cyclists. It's a small collection of houses, a pub, and a general store. The stores owner, Mrs Davidson, supplies just about everything including groceries, fruit and vegetables. A mobile Post Office calls and operates from within the store on Mondays 1pm. – 5pm. and from 9am. – 1pm. on Thursdays. A limited AD122 bus service request halt is close to the village on the A689. There's a good choice of accommodation within the area catering for both short term and long term guests and especially the walkers and cyclists undertaking the Hadrians route. Brampton is the perfect stop-over whether you are taking part in all or only a shorter section of the Walk. It stands in beautiful countryside a few miles to the south of the Wall and provides a varied selection of shops, a Bank, Post Office, Cash Point, Tourist Information Centre, bus and rail services. This ancient market town and surrounding villages has a large choice of year round accommodations serving all categories of guests. 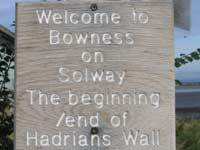 See below for our featured Hadrian's Wall accommodations. Gilsland stands astride the border between Cumbria and Northumbria in the very heart of Hadrians Wall country. Birdoswald Roman Fort, the Roman Army Museum, Poltross Burn Milecastle and the highest remains of the Wall at Walltown Crags are nearby popular visitor attractions. The village's two comfortable pubs and a tea-room provide food and drink and a well stocked general store with cash point opens 7.30am. - 5.30pm. (lunch 12-1.30pm.) on Mondays, Tuesdays, Wednesdays, and Fridays. Half days, mornings only, on Thursdays and Saturdays. Closed Sundays. A mobile Post Office visits and operates from the Village Hall from 1pm.- 4pm. on Tuesdays and 9.30am. - 12.30pm. on Thursdays and Fridays. Good quality comfortable accommodation is available in and close to the village. 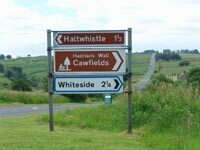 Standing half a mile to the south of the Wall, Haltwhistle is within the spectacular and best preserved section of the Wall between Gilsland and Chester Roman Fort and Museum where the wall crossed the River North Tyne. It is a town attracting an increasing number of visitors to it's walking, cycling and hiking trails and as such is well equipped to meet their needs. There's a good range of shops, a Bank, Cash Point, Post Office and road and rail passenger services between Newcastle and Carlisle. A Tourist Information Centre is housed in the railway station. It is open all year but closed on Sundays and with reduced hours of 9.30am.to 3.30pm. from 1st November to Easter. Tel: 01434-32202. Bardon Mill, Haydon Bridge, Newbrough and Fourstones are small villages with accommodations close to the wall as it continues eastwards in the direction of Hexham. A market town retaining a clear sense of its Border history. The first church to be built here was in 674AD and in nearby Chollerford stands a cross to commemorate the conversion of Northumbria to Christianity. The Hexham Races draws large crowds to what is one of the Norths main horse racing venues and at such times accommodation may be hard to find within the immediate area. Hexham has a wide choice of shops, pubs, cafés, tearooms, a library, Post Office, a Bank and regular road and rail passenger services. Corbridge is rich in Roman History and one of the last larger communities close to the Wall before reaching Newcastle-upon-Tyne. Since its days it was built as the Roman town of Corstopitum it has emerged over the centuries to become an attractive tourist destination of excellent shopping facilities, Post Office, cafés, restaurants, pubs and art and craft shops. Generally busy in the summer months it becomes even more so at the time of the annual Corbridge Agricultural Show and home to the Northumberland County Show held in the early summer. Check for available accommodation well in advance. Situated on the line of the Wall, Heddon is a popular walker and tourist stop. Longer term visitors use it as a base from which to explore the Northumbrian National Park. There are shops, two pubs, a library and a Post Office which opens Monday to Saturday from 7.30am. - 6pm. and Sundays until mid-day. A cash point is inside the building. Next door is Dingle Bell selling hot and cold drinks, a selection of sandwiches and other sundry items. It is on regular bus service route which operates between Carlisle and Newcastle. The Hadrians Wall Bus AD122 runs in the summer months. The closest railway station is in Wylam 3 miles away. The Segedunum Roman Fort Baths and Museum in Wallsend mark, as the name suggests, the end of the Wall. Wallsend lays close to the main conurbation of Newcastle- upon- Tyne which began life as a defensive fort. It is a city full of energy where the walker can rest and celebrate either the start or the finish of an 84 mile journey through some of the most remarkable landscapes in Britain. These can be obtained from Local Tourist Information Centres close to the route and stamped at 6 positions along the way. They are to encourage long distance users to walk the trail during the drier months of the year and so reduce the risk of erosion which occurs in wetter conditions. Please support the people living and working along the route of Hadrians wall by using their accommodation, shops, pubs, restaurants and anything related to your journey, and please do not walk or climb on to the Wall and so help conserve it for the benefit of future generations. Brampton - Banks Turret - 5 miles. Takes in Lanercost Priory/ Outdoor Sculptures. Banks Turret - Wallholme Low Row - 6 miles. Woodlands & lanes, roe deer, red squirrel. Coomcrag Wood - Chapel Burn - 6 miles. Woodland and wildlife. Birdoswald - Gilsland - 7 Miles. Riverside path, steep wooded areas. Newtown - Irthington and Walton - 8 Miles. Pastures and farmland. Please note that dogs are permitted on walks marked with a dog symbol but must be kept on a lead. The Hope & Anchor is all that you could wish from an English Country Pub. Standing on the idyllic Solway Coast and alongside the Hadrians Wall Walk, the Hope & Anchor provides comfortable welcoming accommodation, bar food and a wide selection of Real Ales, wines and spirits. All rooms are ensuite, clean and comfortable. There is wireless internet available in the Hope & Anchor Pub. Martin & Denise Atkinson welcome you to the Vallum House Hotel. A family and friendly nine bedroom hotel with all the comforts of home, excellent food, full license and cheery surroundings. The Vallum House Hotel is situated in its own natural gardens, with car park, on the Western rim of Carlisle on the road to Burgh-By-Sands on the site where the Romans camped. Whether your visit is short or long, we will ensure your every comfort to help you relax. From the Hotel one can view the line of the Vallum and Roman wall, the course of the river Eden, and the distant view of the Scottish Border hills, including Burnswark situated near Lockerbie. The vallum House Hotel commands an important site in History. The 'flat topped' hill on which we stand was used by the Romans as a signalling Garrison, and messages flashed from Burnswark on Solway and along the wall as far as Lanercost and Banks Turret. Our first-class hotel at Burgh Road, Carlisle takes its name from Hadrian's Wall which used to stand nearby. Situated in a select residential area, en route to the Solway Coast, it is open for morning coffee, bar meals and luncheons from noon to 2pm. Afternoon teas, high teas and evening bar meals are served from 6pm to 9pm and dinners from 7pm to 9pm. Our floodlight gardens add to the relaxing atmosphere of the hotel. The hotel has mainly en-suite bedrooms, complete with tea/coffee, television, telephone, trouser press, hair dyers, etc. Only a mile and a half from the centre of Carlisle, and close to the River Eden, we are ideally situated for business men, walkers, fishermen, shoppers, and holiday makers alike. Set in a quiet residential suburb, Vallum House Hotel can meet all your requirements and guarantee your complete satisfaction. As well as our residential accommodation, we offer superb non-residential facilities for dining, private parties, weddings, and conferences. Tantallon House is located on the border of Cumbria and Northumberland, and overlooks the longest unbroken stretch of Hadrian's Wall. We offer a peaceful getaway spot and an ideal gateway to the many places of interest in this area. Our spacious Victorian country property stands on a hill overlooking the Irthing Valley on the edge of the Northumberland National Park. Our bed and breakfast accommodation includes two spacious twin guestrooms with glorious views of the Irthing Valley and Hadrian's Wall. All of our rooms have secure Wifi wireless internet access and Freeview TV. Guests have private dining and lounge rooms to eat and relax in, often with a fire burning during the winter months. Our hearty breakfasts are served at your convenience in the lounge or dining room. Local produce is used where possible. We are happy to cater for special dietary needs. Being on Hadrian's Wall National Trail, Tantallon House offers an especially warm welcome to walkers and cyclists. As well as great facilities, we have knowledge of routes and hikes around the local historic Roman sites. The converted 17th Century farmhouse offers excellent accommodation facilities with breathtaking views overlooking the remains of the Roman Fort. The kitchen is well equipped with a homely feel complete with an Aga to cook on. The accommodation contains 7 bedrooms, many with original features, and consists of bunk beds, wash basin, and full central heating. Bedrooms vary in size, sleeping 3 to 8 people. A disabled bedroom with en suite facilities is located on the ground floor; all others have their own individual shower room near to the bedroom consisting of toilet, wash hand basin and shower. All bedding is included. The location is ideal for walking Hadrian’s Wall; with lots to explore in the area including many Roman sites such as Chesters Roman Fort, Housesteads Roman Fort and Corbridge Roman Town. Set within a 61 hectare estate with views over the Irthing Valley Birdoswald is the ideal base from which to explore the beautiful landscapes of Cumbria and Northumberland, or visit the City’s of Carlisle or Newcastle for shopping and much more. Current prices are £36.50 per person per night which includes full board; bed, breakfast, evening meal and packed lunch. Self catering is £19.00 per person per night. Minimum group size is 15, maximum is 39. Smaller groups may be required to share the accommodation. If exclusive use of the accommodation is required, unfilled places will be charged at the self catering rate to make up the minimum of 20 places. Arrival times are 3.00pm onwards and departure time is 10.00am. Guests staying in the accommodation receive free admission to the adjacent Birdoswald Visitor Centre during normal opening hours. Please note the accommodation is unavailable 16th July 2010 to 12th September 2010. Smoking is not permitted within the accommodation and unfortunately we are unable to cater for pets. Gold award winning 1 bedroom, 4 star, self catering accommodation sleeping 2 people and has been lovingly and tastefully converted from the old granary loft adjoining our own home, The Old Mill, which is in the village of Thurstonfield, just 5 miles west of Carlisle. The Mill was built circa 1774 and was a working water powered corn mill until the early 1900’s. Our home has a delightful, large rear garden for you to enjoy (almost an acre). From your holiday cottage you’ll go down the steps to a sand stone patio/BBQ area leading to the lawn and over to a small woodland area with large mature trees and Powburgh Beck (the original mill stream) running through the garden. The garden is home to all sorts of wildlife and birds. We have our own chickens at the far end of the garden, so you’ll never be short of fresh eggs during your stay! We have lots of woodpeckers, sometimes common buzzards pay a visit to the tall trees and swans and Solway geese frequently fly over. Rabbits are always a welcome sight if they stay away from my kitchen garden! If you’re really lucky you’ll see the red squirrels that call from time to time. Dave Wiseman and family welcome you to Kings Arms Pub, situated in the heart of Bowness on Solway. The King’s Arms is the ideal base to explore the treasures of the Solway Coast and the Hadrian’s Wall National Trail. We are proud to offer bed and breakfast accommodation in double, treble or twin rooms all with TV and coffee making facilities. You can also enjoy evening meals in the family dining room with a wide choice freshly prepared, home cooked food. Relax in the bar with pool table, darts and dominoes and sample our extensive range of Real Ales. Whatever, brings you to Bowness On Solway, relaxation, the wildlife or to explore Hadrian’s Wall, you’ll find a warm welcome waiting for you at the Kings Arms. Hallbarns is a detached farmhouse, on a working farm, situated on the edge of Hadrian's wall. It has recently been refurbished to provide high quality bedrooms and living areas. Facilities include stabling for four horses - so if you want to bring your horse this is a wonderful area for riding. We welcome cyclists and walkers. Packed lunches can be provided and evening meals can be arranged in advance if required. We have hair driers and facilities for drying clothes and boots. Hallbarns is twenty minutes from Hexham, one mile from Hadrian's Wall and three miles from Wark. It is on Cycle Route 39 National Byway. We offer a pick up & drop off service for wall walkers. Accommodation: Bedrooms have Bathrobes,Toiletries, Remote Control TV & Freeveiw. Children are welcome at reduced rates, & a Cot can be provided. Bedroom 1, Twin beds, en suite with shower. Bedroom 2, Twin beds, private bathroom with bath and shower. Bedroom 3, Family room - double bed, plus single with roll out bed beneath - en suite bath and shower. Please come in and see the dining room and sitting room with a real log fire, or enjoy the patio area. We enjoy welcoming our guests. Greencarts Farm is a working farm situated in the beautiful Tyne Valley, surrounded by the magnificent, unspoilt beauty of Hadrian's Wall country. We are ideally located for many of the visitor's attractions that Northumberland has to offer, including The National Park, Kielder Water, The Scottish Borders, Alnwick Castle & Gardens, and The National Trust site of Cragside. Both East and West coasts are within one hour of Greencarts Farm. Hexham, steeped in history and awarded "Market Town of the Year", with its wonderful 7th century abbey, antique shops and many quality food establishments is only 7 miles away. 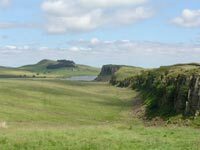 The World Heritage site that is the magnificent Hadrian's Wall with its many Forts, visitor's centres and historical points of interest, literally surrounds Greencarts Farm. A warm Northumbrian welcome awaits all visitors to Greencarts. Being so centrally situated we are an ideal base to explore this spectacular countryside and as the farm sits almost on top of Hadrian's Wall we offer an ideal stopover for walkers and cyclists. Our varied accommodation ensures we have something to suit all. We offer Bed and Breakfast accommodation, Camp Site and camping facilities and Bunk Barn accommodation. Excellent overnight bed and breakfast accommodation for walkers either beginning or finishing the Hadrians Wall Walk. Four centrally heated rooms one of which is a family room on the first floor with en-suite facilities. Please note this is a non smoking establishment. Pets welcome. Vegetarian and special diets provided. For more details, call Mrs Maureen Miller on 016973-51126. Shore Gate House is located in the village of Bowness On Solway at the Western end of the Hadrians Wall Walk. The property was once a corn mill that dates back to 1684 and is within 100 meters of the start point of the walk known locally as the Banks. The property has four letting rooms three of the rooms can be used as either doubles or twins, these rooms have ensuite facilities. The fourth room can be used as a family room and it has its own private bathroom with access direct from the bedroom. The three ensuite rooms benefit from exceptional views across the Solway Firth and onto South West Scotland. Willowford Farm stands on one of the longest unbroken sections of Hadrians Wall still remaining. The farmhouse was rebuilt in the mid 1800’s from stone found in Hadrians Wall. 5 en-suite rooms and a dining room have been beautifully converted from a milking parlour, cart house, grain store and pig holes. Weary walkers will find it the perfect place to rest and relax after a long day on the trail. Margaret and Brian welcome you to their stone built former farmhouse situated in 9 acres of picturesque Northumbrian countryside 4 miles from Hexham. Twin room with en-suite & shower room; double room with private bathroom; Single room with wash hand basin. Cot and an extra occasional bed. Open all year.